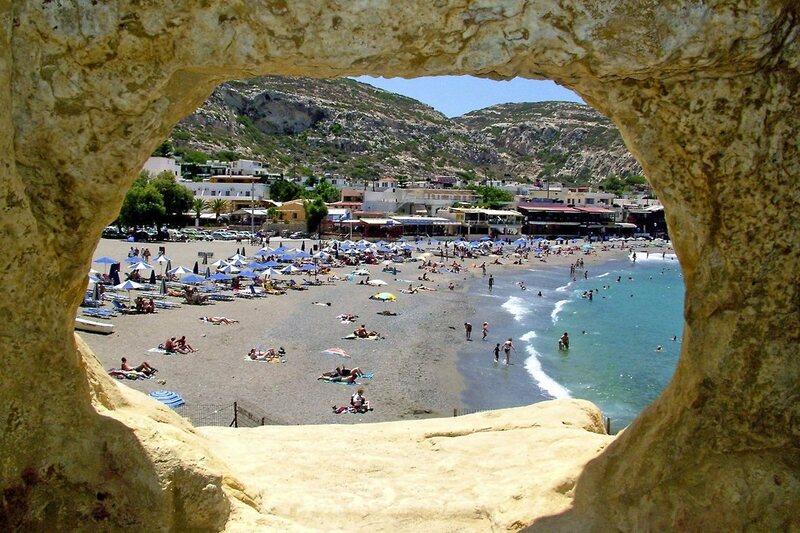 Matala is located 68km southwest of Heraklion, on the boundaries of the plain Messara and Asteroussia mountains. 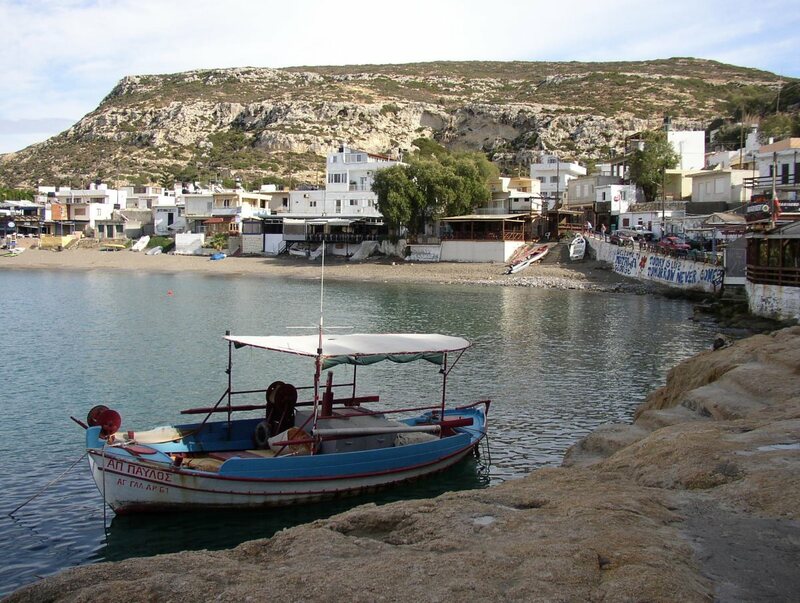 It is one of the most popular tourist destinations of Crete. It is famous for the carved caves in the rocks and the hippies of the ‘70s. It is located close to Phaestos, the second largest palace of the Minoan civilization. 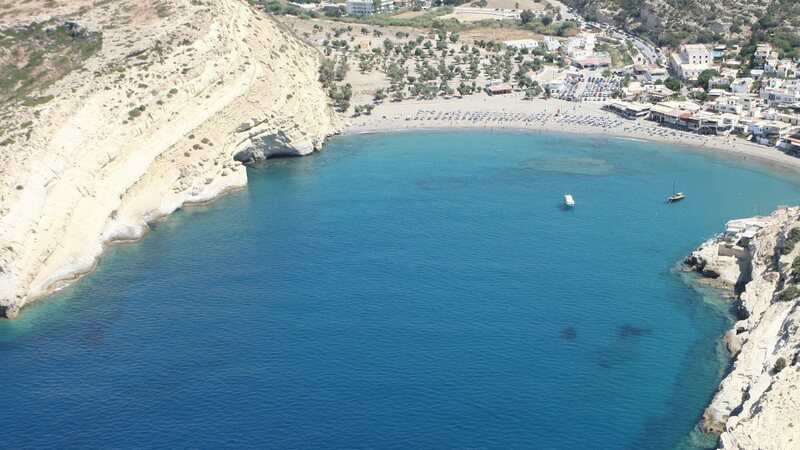 Matala was the port of Phaestos, and in the Roman times, it became a port of Gortys. 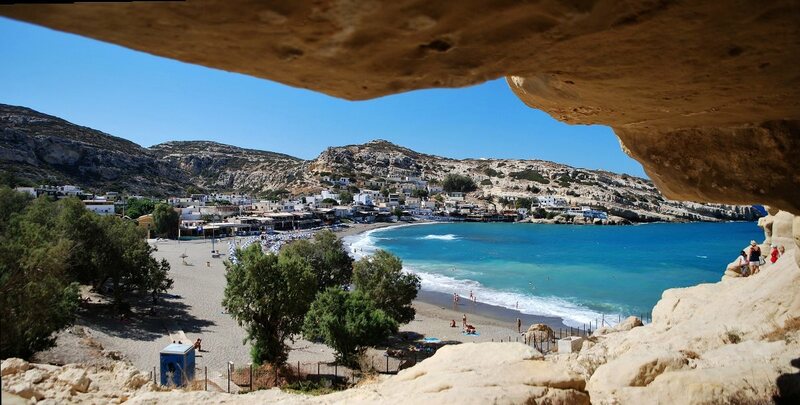 Matala is located at the exit of a small valley, which forms a large enclosed bay with nice view to the islands of Paximadia. It has beautiful beach with fine gravel and crystal clear deep water. The beach is very well organized with umbrellas, toilets, showers, lifeguard, first aids, snack bars etc. 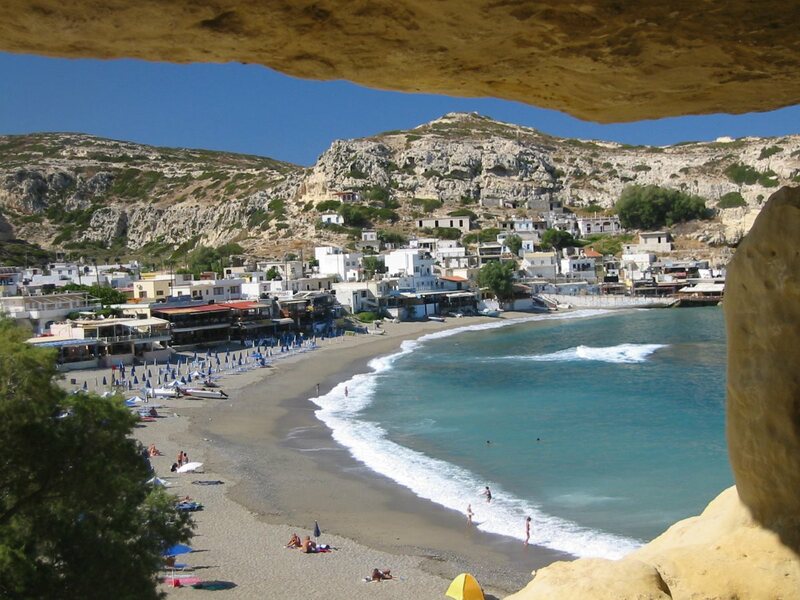 Around Matala you will find many options for accommodation, entertainment and eating. The most striking feature of the area are the caves, carved in the soft white limestone thousands of years ago. 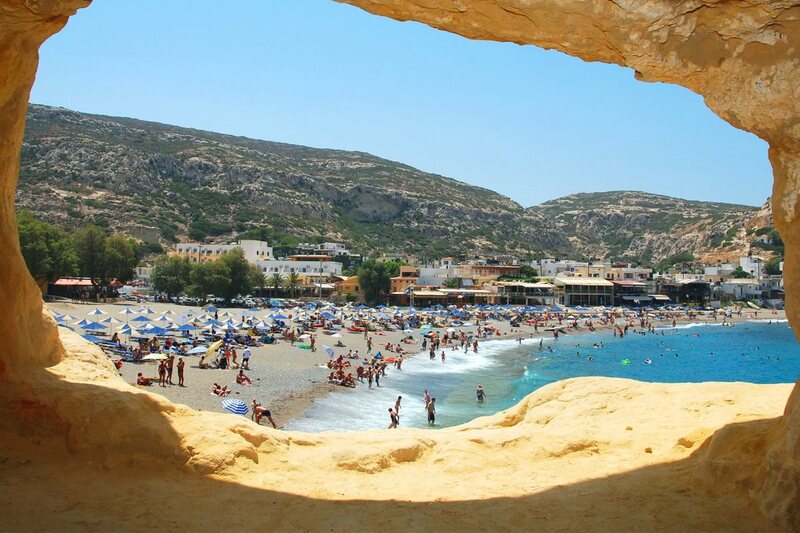 It is believed that the caves of Matala were used as graves in the Roman and the Christian era. However, many of them have rooms, stairs, beds or windows, suggesting that prehistorically they were used as residences. 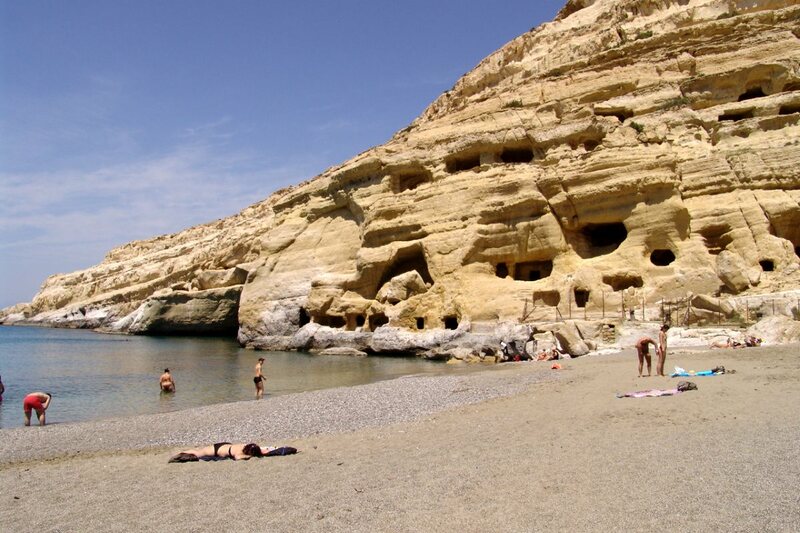 The famous hippies of the '60s and '70s found their paradise in these caves, when they visited and lived in Matala. Hippies expressed themselves freely, enjoying love and creation. The hallmark of the hippies was the two fingers of victory, followed by the slogan «Peace Man». Around that time Matala was only a small fishing village for the inhabitants of Pitsidia, so the sense of freedom was unlimited. 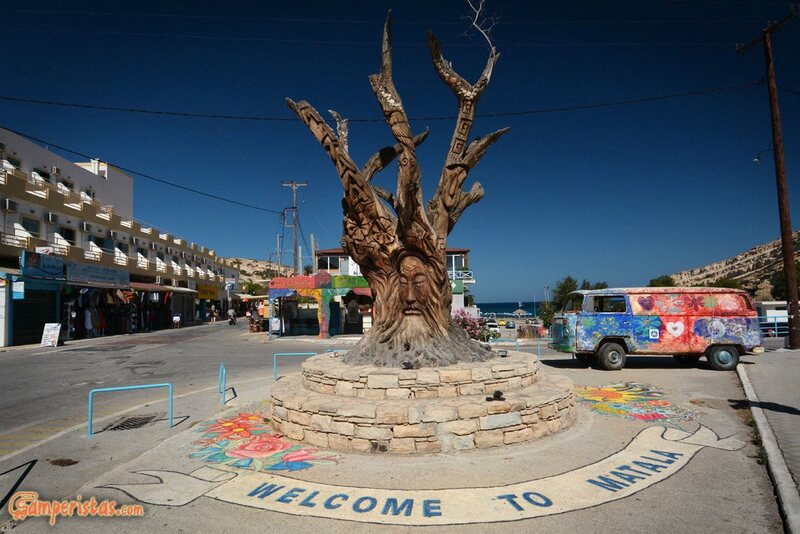 Matala became popular with hippies that attracted several celebrities such as Joni Mitchell (sang a song for Matala called “Carey”), Bob Dylan, Janis Joplin and Joan Baez. In recent decades, the region has faced a rapid development and does not remind anything of the atmosphere of the past. Today you will see hundreds of people, enjoying swimming on the beach, surrounded by modern hotels and talking about the lost past times. The Cape south of Matala is believed to be the Cape Nysos, i.e. the point where the ships of Menelaus were wrecked (according to Odyssey). Southeast of the village, there are ruins of an ancient temple, and near the beach, a marble urn has been excavated. As we said, Matala were a port of Phaestos and Gortys. Thus, ruins of the ancient sunken city have been found in the sea and some small palaces nearby. Furthermore, on the opposite side of the village, over the hill Kastri, there are ruins of a fort, called Koules, and the ruins of a beacon, a place with fire for signaling over land that enemy troops were approaching. Finally, in a cave nearby, you can visit the old church of Virgin Mary, which was a catacomb during the Christian persecutions. All of this historical and natural heritage has helped to protect the region under the international program Natura 2000.